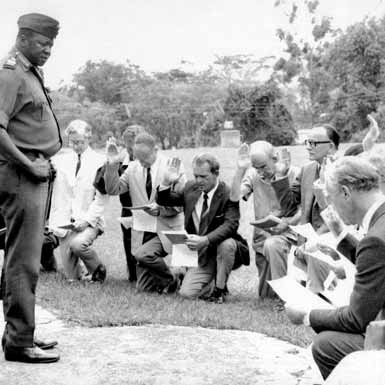 Idi Amin Dada Oumee was President of Uganda from 25 January 1971 to 11 April 1979. His tenure in office is characterised by egregious human rights violations, repression of non-Muslims, sectarian violence, and the ethnic cleansing of Uganda’s minority populations. Amin oversaw the killing of hundreds of thousands of his countrymen, the nation’s Anglican archbishop, chief judge, and an assortment of political rivals, as well as wives and lovers — with whom he’s said to have sired more than five dozen children. In total, Amnesty International estimates Amin’s terror squads murdered more than half a million Ugandans during the mad dictator’s eight year reign of brutality. Within 18 months of seizing control of the country, Amin declared an economic war on the nation’s non-indigenous population — a set of calamitous policies which included the expropriation of businesses and properties owned by Asians and Europeans and transfer of wealth to Amin and his Muslim cronies, or “mafuta mingi.” (2) Confiscating businesses, expropriating property, decimating infrastructure, ravaging Uganda’s national economy and killing anyone in his path are undeniable facets of Amin’s Black Nationalist historical legacy. What was concealed, however, was Amin’s link to Israel — a nation positioning itself to become the leader of a decolonised African superstate. Decolonisation of Africa followed World War II as nation states vied for independence, and weakened colonial powers withdrew their administrators from the region. The United States, Soviet Union, Israel and China were eager to see the Old World out of Africa, and the new one in. There were resources and nations to exploit, arms to sell, and, particularly in Israel’s case, crucial geostrategic alliances to forge. The world’s former colonial powers and burgeoning superpowers had operatives stationed across the Dark Continent, courting the newly empowered and insidiously corrupt African heads of state. Amin was no exception. Decolonization in no way meant political and financial disengagement from Africa. On the contrary, nation states were still to be controlled by colonial powers, just with Black figures at the helm. One can contrast the financial opportunities in post-colonial Africa to the early days of Empire, when private firms like the British East India Company were able to exploit the Indian subcontinent without consequence, simply by allying themselves with Islamic Zamindars and Nawaabs. (3) African leaders certainly presented more malleable targets than British civil service officers, who were obliged to look after their native subjects and report their actions to the Crown. The only difference was the competition. Instead of French, German and Spanish colonial rivals vying for power and control of resources in sub-Saharan Africa, the Americans, Soviets, Chinese and Israelis had entered the fold. Although Pan-Africanism, espoused by Black leaders from both ends of the political spectrum, would have catastrophic ramifications for Africa’s minority populations and the Black masses that relied upon their endeavours for sustenance, it presented a glorious opportunity for the newcomers— especially Israel, whose interest in Amin was especially strong. Amin provided Israel with not only access to resources and a well-connected ally, but crucially, a Black African leader who, it hoped, would one day speak for all of Sub-Saharan Africa. Pan Africanism was a burgeoning phenomenon, and Amin — formerly trained by the British in the art of soldiering and international politicking — was its charismatic figurehead. Great Britain’s rule over Uganda ended on October 9, 1962. Idi Amin, the country’s top-ranked Black soldier, positioned himself alongside Prime Minister President, Milton Obote, who in April of the same year had been appointed Prime Minister by then Governor-General of Uganda, Sir Walter Coutts. With Obote’s support, Amin would quickly rise the through the ranks. In 1963 Amin served as a special trainee of the Israeli Defence Forces, earning his paratrooper wings. Amin spent well over two years training with the Israelis during the 1960’s. By the mid-sixties he had taken complete control of Uganda’s military and its police, and he had been named the nation’s top general. Together, he and Obote restructured Uganda’s government, with Prime Minister Obote penning the laws, and Amin enforcing them. By the mid-sixties, Amin was in charge of Uganda’s extensive Central African smuggling operations, no doubt utilising some of the tactics he’d picked up during his time in Israel. In fact shortly after consolidating power, Amin embarked on his first foreign trip — a state visit to Israel, where he met with Israeli Prime Minster Golda Meir. Meir was reportedly shocked at what she referred to as “Amin’s shopping list for arms” (The Seventies Unplugged: A Kaleidoscopic Look at a Violent Decade, by Gerard DeGroot, May 20, 2011). In spite of Ms Meir’s supposed concerns, Amin left the Holy Land with a personal jet, tanks and hundreds of thousands of dollars’ worth of small arms. Although Britain had little to do with the coup itself, Whitehall welcomed the Israeli endeavour with unreserved enthusiasm. “General Amin has certainly removed from the African scene one of our most implacable enemies in matters affecting Southern Africa…” wrote one enthusiastic Foreign Office clerical official. And he was not alone. The man who’d campaigned most aggressively for Britain to back Amin’s campaign in Sudan and against Obote, with arms and intelligence, was Bruce McKenzie, a former RAF pilot turned MI6 agent. McKenzie, MI6’s senior Africa operator, had deep ties to the Israelis. He’d flown to Israel shortly after the coup in order to procure permission from the Israelis to back Amin’s move against Obote. Still, in spite of all Israel had invested in Amin, bilateral relations between Kampala and Tel-Aviv quickly soured. 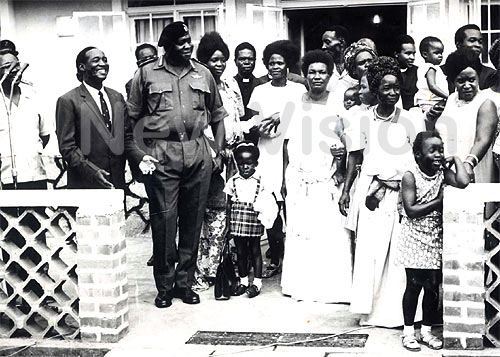 The unstable Amin, infuriated by Obote’s refusal to stand down silently, expressed military ambitions against neighbouring Tanzania, where Obote had fled. Amin immediately asked his closest ally, Israel, for funding and fighter jets to launch the attack, as well as to publicly support his efforts, as they’d done in his ascent to power. However, the Jewish state passed. It appears that it was at this juncture that Amin first reached out to Libya, where a young Muammar Gadhafi would give him financial aid in return for his loyalty. The Soviet Union quickly followed suit and thus began the shift in Ugandan foreign policy, souring of relations with Israel, and the omnipresent anti-Israeli blowback. In response to what Amin viewed as a betrayal, the Ugandan dictator expelled Israel’s diplomatic military adviser to the country. As a sign of his new allegiance with the Arab world, Amin, himself a converted Muslim, expelled more than 500 Israelis from Uganda, before officially severing all diplomatic ties with the Jewish state. Amin then proceeded to shut down every synagogue in Uganda, embarking on a campaign of persecution against Uganda’s indigenous Jewish population, the Abayudaya. Within a few years the nation’s Jews, along with their Indian and Anglo compatriots (or should I say competitors), were expelled from the country. Amin wasn’t done. In a 1974 French-made-documentary, entitled President and General Amin Dada: A Self Portrait, Amin outlined his plans for a future Pan–African war against Israel, using paratroopers, bombers and suicide squadrons — to be funded by his backers in Libya and the Mid East. Amin then embarked on a massive public relations campaign in the Arab world, courting Libya, Iran, the Saudis, Egyptians and displaced Palestinians along with the Soviets, to pursue his goal. (8) “Arab victory in the war with Israel is inevitable and Prime Minister of Israel, Mrs. Golda Meir’s only recourse is to tuck up her knickers and run away in the direction of New York and Washington,” Amin proclaimed to the Arab world. Amin also praised former Chancellor of Germany, Adolf Hitler, for his “Final Solution to the Jewish question” claiming only total annihilation of Israel would result in world peace. Although it is certainly common for world powers to infiltrate unstable nations of geostrategic importance, the fact that Amin’s relations with Israel were hidden for almost three decades is what inspired me to write this piece. The issue for me is not that the Israelis were behind Amin’s rise to power or that they’ve had a hand in propping up some of the worst exemplars of failed African leadership, it’s just that the world was kept in the dark about their involvement. End of Part 1; Part 2: Nelson Mandela, Robert Mugabe’s Ties to Israel. 1. Amin named four of his nine sons, Mackintosh , Maclaren, Campbell and Mackenzie, commissioned bagpipers and Black American jazz musicians to perform in his personal kilt-clad Highland-themed marching band; he also designated a jet to go on the now legendary single malt whisky runs, even declared himself king of the country where he had received much of his military training in Stirling. 2. Mafuta Mingi, in Swahili, literally translated as “too much fat.” Amin transferred money and property he stole from non-indigenous Ugandans and distributed it to his cronies, the vast majority of whom were Muslim of Nubian or Kakwa origin. 3. Titles given by Mughal Emperors to semi-autonomous Muslim rulers. 5. Professor Lofchie — a specialist in comparative politics and African studies, is the Chairman of UCLA’s International Development Studies Academic Program. He served as the Director of the James S. Coleman African Studies Center from 1978 to 1989. His view on Israel’s role in Amin’s rise to power is of enormous importance, as Lofchie is widely regarded as one of the pre-eminent post-colonial African historians. 6. Whitehall is a road in the City of Westminster, in central London, running from the Houses of Parliament to Trafalgar Square. As most of Britain’s Government Ministries are situated along the thoroughfare,”Whitehall” is often utilised as a metonym for general British governmental administration. 7. One of my great uncles worked in Uganda for years as a chemist on a coffee plantation. The management team that ran the enterprise were Jews from New York. They summarily dismissed the idea of Israeli involvement in the coup. When asked about the rumours circulating in Uganda’s elite circles, they would label them as conspiratorial, even anti-Semitic, claiming Israel’s military personnel in Uganda were solely advisers and had no connection to the coup. I recall discussing this period of history with him before his death in 2002. 8. Amin would eventually retire in the lap of luxury in Jeddah, Saudi Arabia, with a half-dozen of his children. He never faced trial for his crimes against humanity.